Comedian Kathy Griffin has apologized in a Twitter video after receiving backlash on social media Tuesday about photographs of her holding a bloody, decapitated head resembling President Donald Trump. "I'm a comic. I crossed the line. I moved the line, then I crossed it. I went way too far," Griffin said. Griffin took down the images from her Twitter account and said she asked the photographer to also take down images. Griffin had posed for the shot during a photo session with photographer Tyler Shields, known for "edgy, shocking pics," according to TMZ. 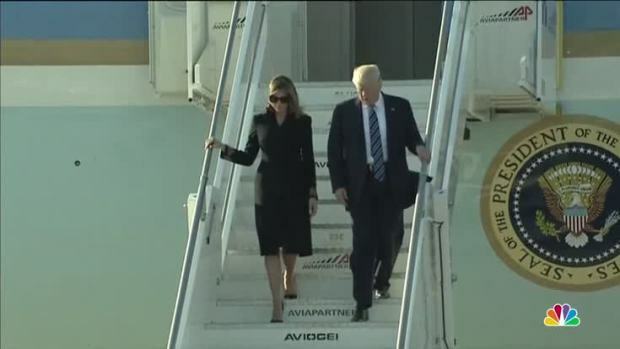 President Donald Trump's first trip abroad since taking office has been filled with viral moments. Here are five that had people talking and tweeting. President Trump slammed Griffin on Twitter Wednesday morning, writing that she "should be ashamed of herself" and that his son Barron was "having a hard time with this." His wife Melania Trump said hours later that the photo was "simply wrong." "As a mother, a wife, and a human being, that photo is very disturbing," she said in a statement to NBC News. "When you consider some of the atrocities happening in the world today, a photo opportunity like this is simply wrong and makes you wonder about the mental health of the person who did it." Trump's son, Donald Trump Jr., was the first Trump family member to rebuke Griffin, saying the picture was "disgusting but not surprising." Without specifically mentioning the Griffin image, the official Twitter account of the Secret Service tweeted they were "on it" in response to calls to investigate the comedian. Chelsea Clinton was also among those who slammed the image. The question was also raised of whether Griffin's photos would affect the comic's relationship with CNN; she has co-hosted the news network's New Year's Eve coverage with Anderson Cooper for years. Cooper tweeted that he was "appalled" by Griffin's photo shoot, calling it "clearly disgusting and completely inappropriate." In a statement on Tuesday CNN said it was "evaluating" New Year's Eve and has not made any decisions yet. By Wednesday afternoon, CNN said it had cut ties with Griffin. Before the apology, Griffin appeared in a behind-the-scenes video and noted that "Tyler and I aren't afraid to do images that make noise." "We have to move to Mexico today because we're gonna go to prison - federal prison," she joked. "Because we're not surviving this."